The 70's are back! Liberate yourself from your skinnies and share the love for this seasons hottest staple: flared jeans. The fit is wide-legged, to-the-floor, and high-waisted, which provides a slimming and elongating sihoulette. There are several different choices out there at any budget. Gap, Express and The Jessica Simpson Collection offer very affordable choices. Whereas, Hudson, 7 For All Mankind, True Religion and Citizens of Humanity don that expensive designer price tag. Wear with any type of heel, a fitted top, belt and bangles for a classic look. Or, pair with a crochet top, chunky platforms or a floppy hat for a more bohemian feel. No matter how you wear them, or what price tag you spend, they will definitely have you feeling and looking groovy this season. It was cold and rainy in AZ over the weekend. Ugh. Can I share with you reason # 1 as to how you know I am an Arizona native? I don't know how to properly use an umbrella. There, I said it! Literally had a fight with it inside of Macys on Saturday. Katie-0, Umbrella-1. And do you know what my favorite color is? Yellow. Instant pick-me-up. When I wear it, I match the sunshine. OK, that is all. Loveyou.Bye. I have been wearing my dark denim flares through fall & winter. I love skinny jeans but I love the wide leg too! Ur too cute, would have loved to see your "fight" in Macy's. Ha! I don't know how to use an umbrella either really... because I choose to forget them at my house EVERY TIME IT RAINS! silly me! I want some of those jeans so bad... wedges and flares. mmm yes! You are just gorgeous! Bright and shiny just like the sunshine! I'm a new reader. Hi! When did you get the jacket? I see similar ones online, but not in yellow. gorgeous pics...as always!!! ;) Flared Jeans FOREVERRRR!!! Very classy looking outfit! I love yellow so much as well! love your yellow jacket! so cute!! Beautiful! Love the yellow coat and your hair is just lovely! Wonderful learning more about you too! love the yellow! and you remind me a bit of jennifer aniston btw. you are so pretty and i love the whole outfit! the style is very slimming and feminine! LOVE the trench! It's so cute and happy. :D Yellow is one of my favorite colors too. There is not a more positive color out there. You look wonderful in these pics! So springy and colorful! You look so great in the yellow coat! I agree, it's a great pick me up color. LOVE your outfit! And im loving that flair jeans are coming back instyle! I got the cutest pair 2 years ago by Joes! Now i gotta try to get back to the same ize i was 2 years ago! haha! A few years ago I swore I would never wear skinnies. Now I'm nervous about going back into flare jeans. They are definitely more flattering though! Yellow is my favorite too! I love that trench coat -- it's so bright and cheerful! Very Jennifer Aniston! And so gorgeous! Love the happy yellow and the flares! You look so trendy and cute! I love your style!!! i know that post was about clothes, but your hair is divine! i love the color and length! Love the yellow jacket! Also, those sunglasses are fabulous! sooooo cute. you pull those jeans off soooo good! wow, you're spot-on with the 70s look! i love those flared jeans on you and yellow is definitely your color! That is such a sunshiny happy 70s look it's freaking amazing! Wearing yellow when it's raining outside is genius! It instantly brightens up everything in the room. i am excited for flares, but do love my skinnies still, yellow has beome one of my favorite colors recently and, my name is kate also!!! Loved your bangs you wore... super cute girl! Gorgeous!! I saw this trend... I'm not sure about it - you look stunning in them, but I don't know if everyone can pull them off! I will definitely have to try a pair on! I am loving your blog! Your photos are really good. Thanks for your comment on my blog. Oh my gosh... you look so great in yellow! I just found your blog today and I couldn't be any happier :) It's sooo lovely and you are sooo gorgeous! I'm going to try the tip you gave on comment signatures out soon. Thanks for that! I am an Arizona Girl born and raised until recently we moved to NC for my husbands job. I miss the weather and the freak shower storms. I love flared jeans it suits every body shape especially curvy ones like mine and it goes with almost everything. I'm so excited to pull my flared jeans out again! I love them with heels! 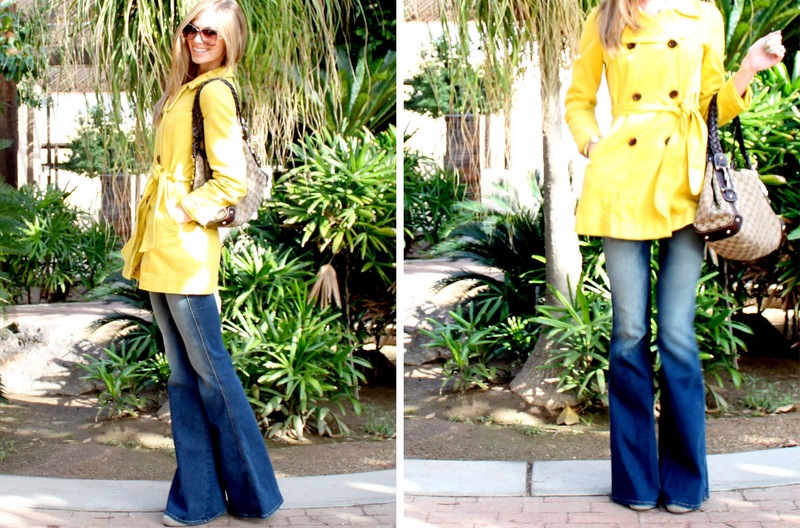 That yellow trench is amazing! What a great coat! I think I'll be getting those JBrand jeans tomorrow. They look great on you! We definitely share the love for the 70s fashion! Unfortunately, I'm too short to wear flared pants (I wish I could) but it looks very good on you. It made me think that I should pay more attention to high-waisted jeans. haha, too funny! Love the flares on you & yellow is my fave go-to happy color! Love your coat!! eee! i cannot even put into words how glad I am we are moving from skinnies to wide, flared legs. SO good.